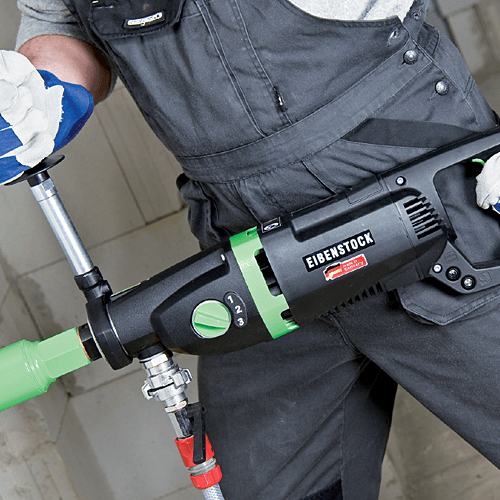 Eibenstock ETN 162/3 PSA is the Versatile Combination for Wet/Dry Drilling up to 6-3/8" dia. in concrete and reinforced concrete; up to 8" in brick, block and soft masonry materials. Use hand-held or Rig Mounted. 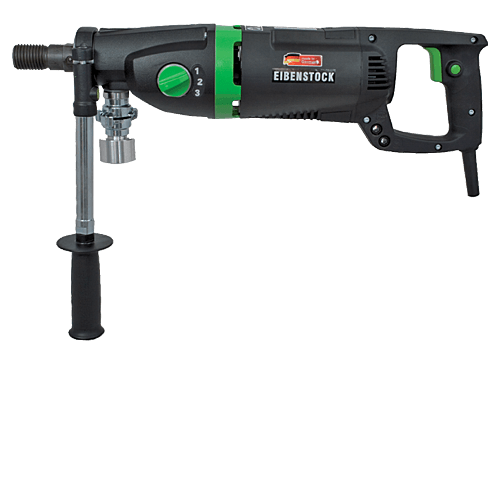 The Eibenstock ETN162/3P Three speed core drill motor is a fast, efficient core drilling system. 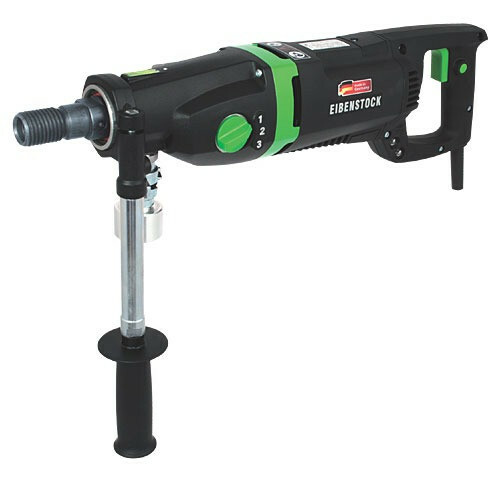 Use hand-held for up to 3-1/4" diameter and/or rig-mounted for up to 6-3/8" diameter in concrete, or upto 8" in brick. This model comes from the factory with a L5-20P 20 Amp Twist-Lock Plug. Model ETN 162/3 PSA is a versatile 19 Amp Wet or Dry Diamond Core Drill with a Water Swivel and Dust Extraction Port built directly into the spindle supporting holes upto 8 inches. Electric Core Drill, 3-Speed, Wet / Dry with Vacuum Dust Extraction Port, For coring holes of up to 6-3/8" diameter in concrete, 8" in brock. Load Speeds: 510-1150-2500 RPM, 19.5 Amps., Wgt: 15 lbs. Dry drilling in sand-lime brick, brickwork, clinker, brick and other abrasive materials as well wet drilling in reinforced concrete, natural stone and asphalt. It easily connects to a vacuum for dust extraction. 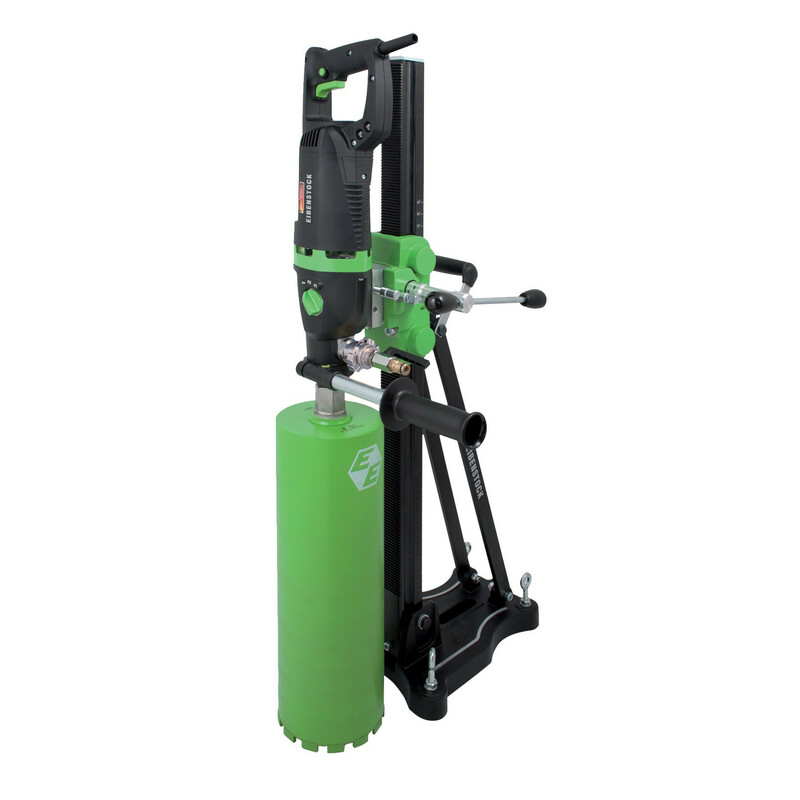 The drill stand mount allows the operator to switch from hand-held to stand-mounted drilling quickly. The drill stand (optional) is adjustable up to 45°. Core drill includes drill bit connections/adaptors for 5/8" x 11 UNC and 1-1/4" x 7 UNC. Works with segmented diamond core bits. Options include anchor stand (with or without vacuum pump), centering aid, portable water tank, water collection ring kit and more. All Eibenstock core drills carry a 1 year manufacturers warranty standard. Builders Depot® is an authorized service center for many brands including Eibenstock, Core-Bore, Milwaukee, and more.